Are you one of those people who get a letter from your insurance company in the mail, open it to see that it's not a bill, crumble it up into a wrinkled ball, and then promptly toss it straight into the garbage can? I am. Well actually, I used to be. June 6, 2018, 7:03 a.m.
May 10, 2018, 3 p.m. The guest post below was written by Michelle a stay at home mom who is on a journey to financial independence. Are you one of those people who get a letter from your insurance company in the mail, open it to see that it's not a bill, crumble it up into a wrinkled ball, and then promptly toss it straight into the garbage can? I am. Well actually, I used to be. I used to be a person that figured that if it wasn't asking me to pay anything, reading it or even just looking at it wasn't worth my time. But little did I know that bills aren't the only important paperwork that you may receive from your insurance company. You see, insurance companies also send out something called the "Explanation of Benefits", or EOB for short--and this little number can save you hundreds, or maybe even thousands, of dollars. If you bother to look at it, that is. What is an EOB, Anyway? An EOB is basically a itemized list of claims that the insurance company has received from a doctor or medical provider that you attended for a service. They are sent to you basically for informational purposes and for you to keep for your records. For example--you may go see your doctor, Dr. Tim, about a lingering cough, stuffy nose, and sore throat you've had for weeks. You originally thought that it was just a cold that would resolve itself in a few days, but you just can't seem to kick this bug. Dr. Tim gives you a once over, a throat swab to check for strep, and eventually prescribes an antibiotic for a mild sinus infection. No big deal. A few weeks later, long after your sniffles have left the building, you receive an EOB in the mail. It lists the date you saw the doctor, the name of your doctor (Dr. Tim), and the procedure (throat swab and check-up) that was completed. But more importantly, the EOB will outline how the charges were processed and paid by the insurance company. IF they were paid. This time, your charges for Dr. Tim were covered in full. Lucky you--you've already met your deductible and you have fantastic insurance. However, if the charges weren't paid, or were partially paid, there will be a section describing the amount you owe. This section is not money you owe to the insurance company, it's money that you owe to the medical provider. That means that you're likely going to be receiving a bill in the mail later requesting a payment from your doctor, hospital, or wherever you incurred the charges. The time frame on your receiving this bill can vary. In my experience, this bill can come very shortly after your EOB, a rather long time after your EOB, or even before your EOB even makes it to you. There doesn't seem to be any rhyme or reason to the schedule. Insurance companies and medical offices are often on different billing/mailing schedules. If you get your EOB before your medical bill, the best thing to do is set it aside and wait until your actual bill comes in the mail. Set your EOB somewhere where you're going to be able to find it again--do not lose it! This is important. You're going to need to compare the EOB to the bill when you receive it. I used to be a person that would trust that the insurance company and my doctor's office would always charge me the correct amount of money. And I kept being dumb until one day when I opened up an EOB on a whim, just to see what this thing that my insurance company kept sending me was all about. 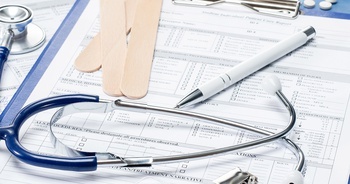 It is estimated upwards of 30% of all medical bills contain errors. Upon opening the EOB, I realized that I was being overcharged $20 by my health provider every time I went to the doctor for an appointment that I was attending either weekly or bi-weekly. $20 may not seem like a lot as far as medical bills go, but paid on a weekly and/or bi-weekly basis $20 quickly turns into quite a chunk of change. Now, this was an honest mistake by my doctor's office. For some reason, they had misjudged my co-pay and were charging me the extra $20 because they truly believed that was what I owed. When I brought the matter to their attention, they quickly verified with my insurance company and I had a refund check ready for me at my next appointment. But if I had just thrown that EOB in the trash that day, like I was prone to doing, I would have kept on being overcharged. A couple hundred dollars poorer, and none the wiser. Comparing your medical bill with your EOB is pretty simple. There should be clearly marked procedures (sometimes these are coded, but there's often a key to tell you what the codes mean) along with the date the procedure was completed. Sometimes it will list the doctor's name as well. Compare the dates, procedures and names listed on the EOB and bill to make sure that everything matches up just right. There should also be a clearly marked area on both the EOB and medical bill that states what you are required to pay. Remember, the EOB is just information for your records that comes from the insurance company, and the actual medical bill comes from the medical provider/doctor. In other words, the medical bill is actually the total amount you are on the hook for. So it makes sense that the medical bill and the EOB should list the same amount owed, right? Sure. That does make sense. But life doesn't always make sense, and neither does health insurance. So let's talk about when the two amounts don't match. Let's use the example I already mentioned about my being mistakenly overcharged $20 for my reoccurring medical appointment. The mistake was brought to my attention when I got an EOB in the mail stating that my insurance company had received a claim from my medical provider, which they covered, but my co-pay was $20. However, my doctor was charging me $40, and had been for the last several appointments. Well, well, well. Now we have a problem. To handle the problem, I rifled through my old paperwork and pulled out my insurance benefits package for the year. It stated that the co-pay was, in fact, $20. Step 1. Next, I called my insurance company just to verify this information so that I didn't look like a jerk charging into my doctor's office, EOB in hand, demanding a refund on a co-pay that wasn't even correct. They verified that my was co-pay was $20. Step 2. Here comes Step 3: the hard part. Confronting the doctor. Well...maybe. Depends on the doctor's office. I'm sure that everyone who works in doctor's billing departments are lovely people, but sometimes talking to them is like talking to a brick wall. They have a tendency to throw all kinds of insurance jargon at you that may as well be an entirely different language completely. And they hate calling the insurance company as much as you do, so I've often been stuck in the middle, made into an involuntary and unenthusiastic messenger between the medical office and insurance company. Luckily for me, in this instance I was attending a very small, family run office who were more than happy to call the insurance company for me and work out the issue. This made the transition from a $40 co-pay to a $20 co-pay swift and painless. Swift and painless is great, but it wouldn't have even happened if I hadn't of been comparing my EOB with my medical bill in the first place. No one is going to do this for you--you are responsible for checking this stuff yourself. What's the Point? The Insurance Company Probably Got it Right, Right? That would be nice, wouldn't it? Sadly, the insurance company (and/or the medical billing office) don't always get it right. We can't get too mad at them though--they are human, after all. Sometimes coding errors are to blame for problems with EOBs and medical bills. In this case, the amounts on both may match--but will be not what you expected. I've had coding errors push routine medical procedures or checkups into the "not covered" realm and subsequently be rejected by the insurance company. When this happens, your medical office can just resubmit the claim with the correct code applied. This usually isn't a big deal. Many times, problems with EOBs and medical bills can be due to a miscommunication. This is what caused my aforementioned co-pay debacle. But the opportunities for miscommunication between offices don't just end at co-pays. Let's take my twins' birth for example. A few weeks after they were born, I started receiving an onslaught of bills and EOBs in my mailbox detailing all sorts of payments for medical procedures on Twin A that I was going to be responsible for. This was alarming, especially since my deductible had been paid off by the second or third pregnancy ultrasound. And also because my twins were a teensy bit premature and required more medical monitoring than a newborn normally would. But the real kicker was that Twin B's procedures had all been covered--so why was I being charged for one twin and not the other? As it turns out, the insurance company apparently didn't realize that I had TWO babies at the same time and dismissed all of Twin A's claims as duplicate. The hospital had billed everything under my name, so there was no way to tell that there were actually two separate babies' claims being submitted. That's one hell of a miscommunication. And it would have costed me a lot of money if I hadn't been paying attention. It took several weeks and probably 30 phone calls to get straightened out, but the effort saved me at least $1000 dollars. The bottom line here is this: insurance is extraordinarily complicated and confusing for most people, and it's easy for all sorts of things to get caught up in the mess. Make sure that you know your policy--your deductible, your in-network doctors, procedures that are covered, etc. And if you can't memorize all that (who can? ), at least have your insurance information at the ready so you can reference it if you need to. Like I mentioned before, it's your job to make sure that you are being charged the correct amount of money for your medical procedures. Mistakes do happen and no one is going to find and correct them for you, least of all your insurance company. So when you get those silly little EOBs in the mail, make sure you save them! Don't just banish them to the trash, alongside this morning's cold, soggy coffee grounds. They’re important--and could save you hundreds, or even thousands of dollars one day. Keep in mind putting any kind of financially sensitive document in the trash is opening you up to identity theft. Here are some ways to protect yourself from identity theft. This was fun! Thanks so much for allowing me to post!